Editio princeps anno 1916 promulgata est. A Portrait of the Artist as Young Man est mythistoria prima ab Iacobo Joyce die 29 Decembris 1916 Anglice edita. Opus partibus quinque experimentalem narrandi modum exhibet, quod Stephani Daedali vitam iuvenis flumine conscientiae narrat. Stephanus primum Catholicam religionem servit. Quaerendo tandem se repressum esse religione intellegit; ergo Europam liberationis quaerendae proficiscitur. Cognomen Stephani "Daedalus" a Metamorphosibus Ovidii ortum est. Libri epigramma est "Et ignotas animum dimittit in artes" (Ovid. Met. VIII). Opus quaestiones identitatis artisque explorare conatur. ↑ Bloom, Harold, 1988. Page 6. Bloom, Harold. 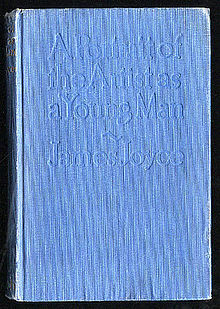 James Joyce's A Portrait of the Artist as a Young Man. Novum Eboracum: Chelsea House, 1988. Page 6. Novissima mutatio die 20 Octobris 2018 hora 02:59 facta.